My good-luck pizza, ready to go into the oven. Every year on New Year’s Day I struggle with my superstitions and try to put together some sort of good-luck meal. As a kid I always heard from my family that we were supposed to eat lentils that day, but we never bothered, so I guess nobody in my family actually thought you could eat your way to good luck. You can certainly eat your way to bad luck, as my 460-pound, five-foot-four cousin “Joe Beef” did a few years ago when he dropped dead of a heart attack at age 37. When people eat for good luck in Italy or with an Italian mindset, it seems always to be with a wish for more money, with no peace on earth necessarily attached. The thinking has been that eating round things like lentils will bring you this luck, probably because they somewhat resemble coins. When I started running my own home kitchen I made it a point to serve lentils and sausage every New Year’s Day, to bring me success, but the dish actually worked only one year out of the four I served it, so I lost interest. Since then I’ve made no good luck meal at all, assuming I’d been had. A year of not so grand financial success has got me thinking about good-luck eating again, but I’ve decided to ditch the lentils, which I find somewhat dreary, and just go for the round. For real luck, I’ve decided, round must also mean good, not just a bowl of sad gray lentils. It’s got to be good and round, like a beautiful white porcelain dinner plate, or the rim of a wine glass filled with red wine, or round slices of fine salami on a round platter, or slices of round tomato and mozzarella on a round platter, or the best round food of all, pizza. Food in rounds always seems more appealing to me than food with angles; it’s warmer and better suited for Italian flavors, I think, and it’s obviously much better suited to bringing me financial success. I’ve decided that a round pizza topped with all round things will bring me very good luck this coming year. My favorite pizza at La Pizza Fresca, one of my favorite pizza places in Manhattan, is one topped with buffalo mozzarella, paper thin slices of pancetta, and onions, all rounds. Everything melts together beautifully into a mellow wholeness. This pizza is called Rustico on the menu. I’m not sure why, since it’s actually a lot more elegant and refined than some of the others on the menu. Here’s my version of La Pizza Fresca’s wonderful, good-luck-bringing pizza. I hope it brings you much luck, financial and even in peace on earth, in the coming year. Dissolve the yeast in 1/4 cup of warm water. Wait about 10 minutes. Add 1 cup of the flour and sprinkle in about half of the salt. Mix with a wooden spoon. Add 1/2 cup water, another cup of flour, and the rest of the salt. Mix again. Add the last cup of flour and about 1/4 cup more water. Mix well until you have a big sticky ball. Turn the dough out onto a floured surface and knead until it’s soft and smooth, about 6 or 7 minutes, adding sprinklings of flour as needed to prevent it from sticking. Place the dough in an oiled bowl and cover it with a cloth. Let rise 2 1/2 to 3 hours, or until it’s doubled in size. 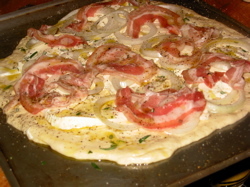 Using half of all the ingredients, lay on the buffalo mozzarella rounds, scatter on the rosemary, then lay on the onion rounds, and finally the pancetta. Season with salt and freshly ground black pepper. Drizzle with fresh olive oil, and bake until bubbling and browned at the edges, about 15 to 18 minutes. Serve right away. Make another pizza with the remaining ingredients.